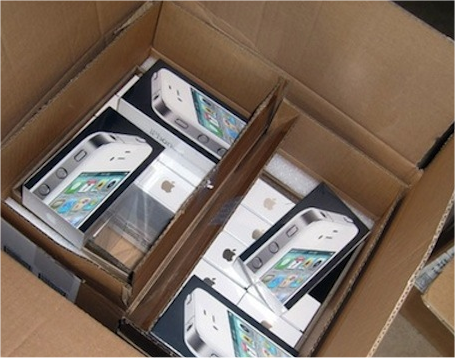 The images in the delivery box appear to show the version is based on the original iPhone4. This is rather than the recently enhanced black version launched on Verizon in the USA that contains an improved antenna; overcoming the flaw that the iPhone 4 is great unless you are a left-handed user who holds the phone in the wrong way when making a call. The white version has been delayed for months, due to problems with the paint cracking and reports of light leakage from gaps in the fascia. These issues have been overcome and the photo is from a box delivered to a retail outlet in Belgium, ahead of the launch there. It’s a long wait until September for iPhone 5, but a white iPhone 4 isn’t tempting me.